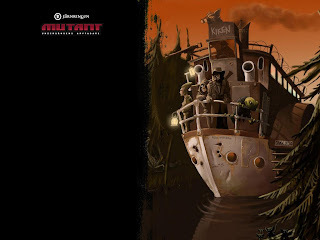 Awhile back my buddy Joe sent me this really cool Post Apocalyptic RPG. It is called Mutant Undergangens Arvtagare. If your going huh? That's understandable because it is in Swedish!! It looks like a very Gamma Worldesque game set in a Post Apocalyptic Europe, particularly in and around Sweden. 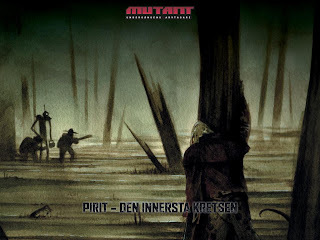 Lots of support for it at one time over in Sweden, but it now seems to be Out of Print. So I guess the chances of this being ever officially translated to English are slim to none. Aahh the humanity! In trying to interpret the rules (I don't read Swedish) it seems to be based off of the BRP system. The art is quite good. Here are some pictures to show you what I'm talking about. Pretty cool! 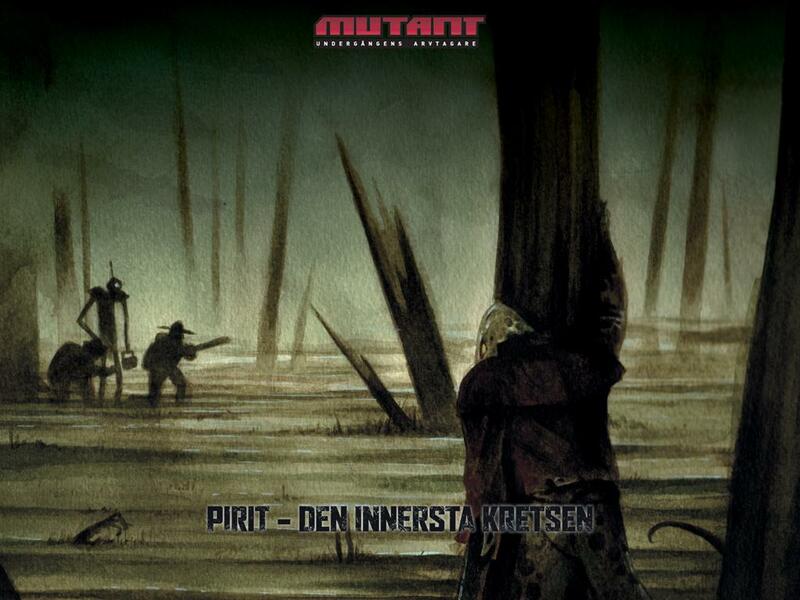 I can at least use it as inspiration for my Mutant Future or other Post Apocalyptic Campaigns. 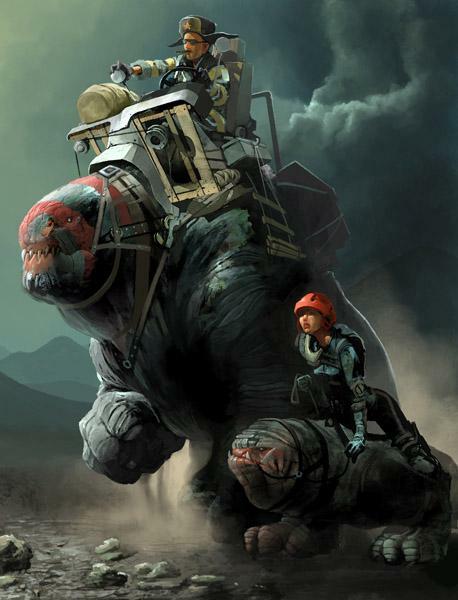 Here's a cool video for your Post Apocalyptic Weird Science Fantasy Campaigns!! Another beastie I found in my old DM binder was a simian race I based off of a race from the Rolemaster RPG many years ago; the Sea Kral. No Spellcasters! The Sea-Kral are superstitious about magic and kill any practitioners found in their midst. Sea-Kral are ape-like creatures with dark bluish skin and a pelt of thick blue hair growing on the head, neck and shoulders. Females possess an additional thicket of blue hair that grows down the bony spine of their backs. Both genders have long arms and an extra bone connecting the wrist to the hand. Long dextrous fingers capped by a claw-like nail, aid them in becoming accomplished climbers, craftsmen and bowmen. They build longships, in which to ply the seas, raiding and plundering other vessels as pirates, as well as, raiding coastal towns and villages . Their boats serve as their only home, in spite of the fact that most cannot swim. Sea-Krals fear the hungry waves, but derive too much pleasure from their violent way of life to abandon the ocean. With the Sea-Kral preferring cooler climes, many coastal towns and villages have an additional reason to dread winter, because with the coming of the cold, so come the Sea-Kral. I was going through a box of some of my old AD&D DM Binders and came across this write-up I did many years ago. 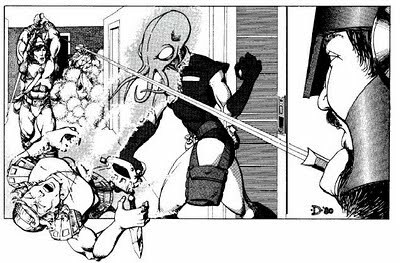 I recall basing it upon someone else's conversion for the Palladium Fantasy RPG that I found on the 'net, but I couldn't tell you who the original author of the Palladium conversion was, that was before Palladium Books went all Cease and Desist on anyone doing conversions for their stuff. Anyways thought some of you might get a kick out of this, particularly those of you who game with your kids. I also think they would fit in nicely in a Tellos based Campaign setting. Alignment: Any (however 70% are of a good alignment, evil ones are rare and are not tolerated within a Gummi Bear colony). No. Appearing: 1d6, a colony may have up to 50 individuals. Damage/Attack: 1d3/1d3/1d4 or by weapon type. 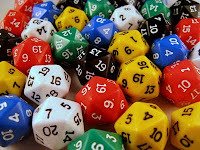 Special Defenses: Immune to plant toxins, save vs. other poisons at 4 hit dice higher. Size: 2-3 1/2 ' tall Weight: 25-75 lbs. Spell Like abilities: Charm Person 1x day, Detect Evil 2x per day, Tongues 1x day. Natural Abilities: Keen normal vision, Animal Empathy, Infravision 50'. Skills & Languages : Common, Faerie and one additional language. All are taught herbalism at an early age. Most are also accomplished singers. Gummi Bears are a race that has for the most part gone unnoticed. They are small bear-like creatures that inhabit dense forests on the outskirts of human settlements. They maintain a keen affinity with most wilderness creatures and strive to live in harmony with their environment. They are very curious about human culture, but have, so far, been too cautious to announce their presence. However, this curiosity has caused them to locate their colonies or "Hives" close to human settlements, so that they can observe the humans in secret. Their communities tend to be underground dwellings, a traveler could be walking over a Gummi Bear community and would never know it. While little is known about these creatures, sages speculate that they are in some way related to Faeries, evidence of this lies in their high magic resistance, innate spell powers and their ability to concoct magical potions. Appearance: They look like small humanoid Teddy Bears. A mystical concoction made from the elusive "Gummi Berry". When a Gummi Bear consumes 1 oz. of "juice" he gains the strength of a stone giant (20) as well as, 1d4 additional points to constitution and dexterity for approximately 10 minutes. On humanoids the effects are highly variable, but also short lived. Irregardless of race the effects of Gummi Bear Juice can only be experienced once per day, further consumption will only resort in a pleasant "giddy" feeling. The most common effect non-Gummy Bears experience is stone giant strength (20) for 2 minutes, however, other effects have been known to occur (see below*). Please note that these potions are extremely rare and can only be made by the colony's chief Alchemist/Herbalist (who is apparently always a female). As a consequence price is very high for non-gummi bears even those favored by the hive. It has been reported that the chief alchemist-herbalist can also make other potions as well. Reports vary but the two most commonly reported are potions of healing (made from rare bee honeys) and sweet water (harvested from the dew of an unknown deep forest fern). 90-98- Super Batch (sorta) save vs. poison; failure means acts as normal but drinker is -2 to all actions for next d6 rds, success means works as normal but is also +2 to all actions for next d10 rds. 86-97- storm giant strength for 2 minutes. 35-85-stone giant strength for 5 minutes. 19-34- hill giant strength for 1 minute. 12-15- Eww Nasty! save vs. poison; failure : severe diarrhea for 1d4 hours, success; bad flatulence for 1d4 hours (can't surprise anybody!). 01- Really Nasty Stuff! save vs. poison or suffer -1 point from constitution permanently!! My Most played D&D Module that I've never played D&D with! The classic Expedition to the Barrier Peaks! I love this module. Lasers and Magic items Whoo hoo! 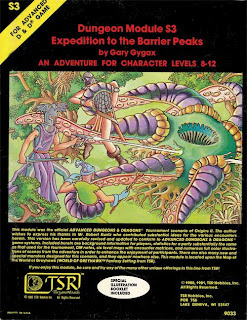 I think I have used this module in my games over the years more than any other module in my collection, well except for maybe Keep on the Borderlands, followed up very closely by In Search of the Unknown. But the twist is that I have NEVER used it for a straight up D&D game. I've used it in two Gamma World Campaigns, Rifts (the player Dragon Hatchling fighting the Froghemoth was priceless), Star Wars, Heroes Unlimited (almost had a TPK on that one! ), Ninjas & Superspies, d20 Modern, and more recently Mutant Future ! Yet I just realized I never used it for a regular straight up D&D game. How wild is that. Just further credit to the genius of Mr. Gygax. I just may have to rectify not running this for "regular" D&D at some point. Course I need to track down a new copy, mine is ragged and worn out from such heavy use over the years. One of my absolute favorite drawings by Jeff Dee! 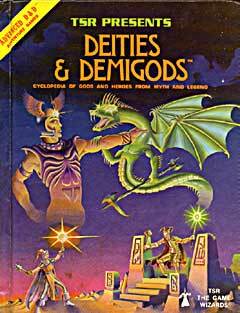 Believe it or not the first Hard Back RPG I bought was the original edition AD&D Deities & Demigods, you know the one with Cthulhu and Elric! I was but a wee lad and was still trying to get my head around this whole "D&D" thing. 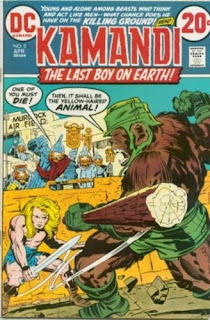 I had recently picked up the Gamma World boxed set and loved it but wasn't sure what to make of this whole ADVANCED series of books. I had played D&D with my cousin, he took me through White Plume Mountain, I was a FIRST level dwarf BY MYSELF! My cousin said Infravision was stupid, I hadn't bought any torches cause I was a dwarf with Infravision, he said it didn't work AFTER I got in the dungeon, I Died in the dark, Quickly and horribly and still am not sure what killed me, he said it was too dark for me to see. Even though I was a newby I knew something was awesome about this game and something was not so awesome about my cousin's DMing skills. I decided to get the books and figure this whole D&D thing out for myself. I had always loved Norse and Egyptian Mythology and just knew that Advanced or not this book was for me! With my limited allowance I could only buy one book, so before I got the Player's Handbook, DMG or even the Monster Manual I was the proud owner of Dieties and Demigods. In retrospect this purchase, as well as starting with Gamma World has warped my perspective of how to play/run D&D ever since. I love weird races and beasties in my games, I frequently use planar adventures/misadventures etc, and my players usually have to scrape/scavenge for every bit of treasure gear they get (a la Gamma World). Magic items are often weird, unusual or mysterious forgotten relics and I often have dark and mysterious gods/temples in my campaigns, with a healthy dose of knights and other stuff. 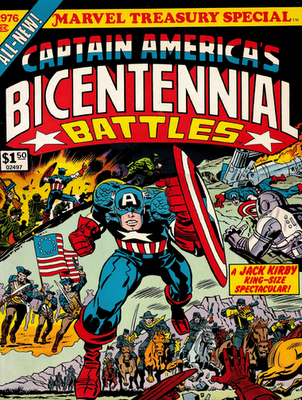 To my young gamer eyes, this book was the mother load, I could have dark Cthulhu gods, with native american heroes alongside Arthurian knights keeping a watchful eye on their albino "ally". I didn't let my cousin DM after that, I took over the reigns and have never looked back! Nothing like a classic Kirby cover from the awesome Kamandi comic from back in the day. Hope your Simian Saturday is a good one! There is a bit of blood in this, but the bungee jump at the end is priceless!! 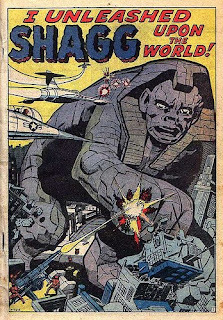 I Unleashed Shagg upon the World!! 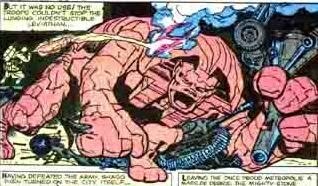 Special Attacks: Slamming Fists!, Crushing Stomp! Special Abilities: Wielding Cosmo-Gamma Electro-Magnetic waves!!! 66' high, 241' long! 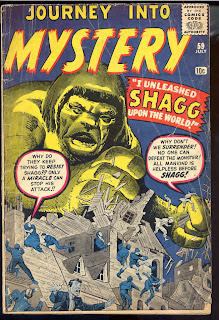 The massive construct known as Shagg is a near unstoppable force of power and destruction. If that wasn't enough it wields powerful Cosmo-Gamma Electro-Magnetic Waves which can apparently alter reality… Yikes!! 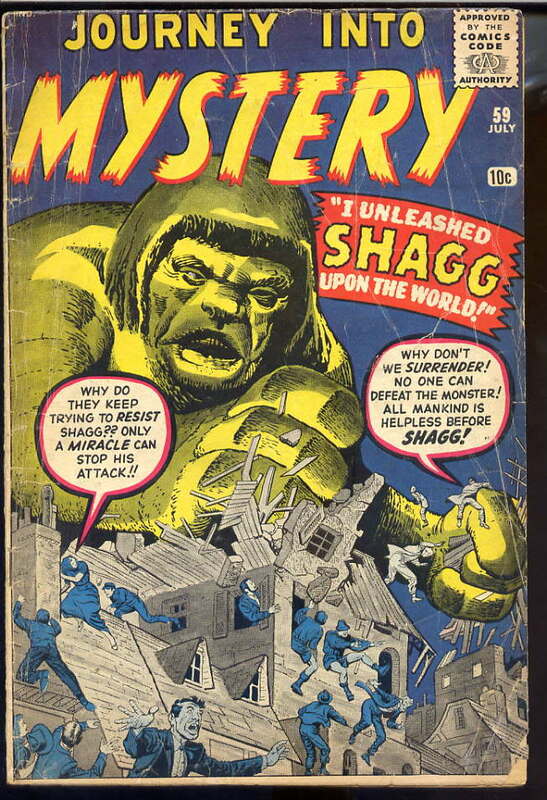 Ok, clearly I statted up Shagg as more of a gag or a DM plot device than anything else, still it is fun to look at these old comic monsters from the early 60's. 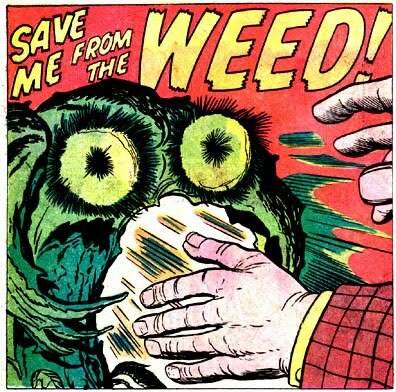 Save me from The Weed!! How's that for a title that made you think of something else?! I'm sure "Weed" had a different connotation back in 1962. Anyways I haven't posted any critters in awhile and I thought this one would make for a fun write-up. This is primarily worked up for Mutant Future, but with some minor tweaking it would work fine for an unexpected threat in a Labyrinth Lord game. If I ever get to run Planet Algol, I might could see using this beastie in the Slime Lands also. Special Abilities/Mutations: Neural Telepathy, Empathy, Fragrance Development, Epidermal Photosynthesis, Full Senses (sight), Possession. The Weed is a newly awakened sentient mutant plant with extremely limited mobility. It has a high intelligence and a wide array of mental powers including telepathy. The Weed can overpower others mentally, and force them to do its bidding. The Weed's main vulnerability is that it must be rooted in fertile soil. The Weed considers all of humanity to be nothing more than slaves meant for it to conquer. It hopes to create an army of minions to force its will upon the stupid mammals and beasts that walk the earth. In time it will have a much larger hoard, as well as, servitor minions, but for now it has a limited area of influence. It will consider other intelligent mutant plants, like Brain Plants which it may be related to, a threat to its supremacy and will work to have its minions destroy any and all that they come across. 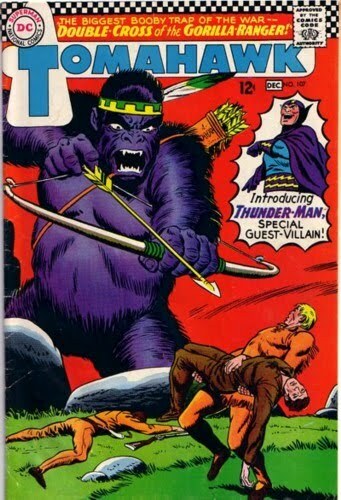 Simian Saturday; Giant Purple Gorilla Ranger! 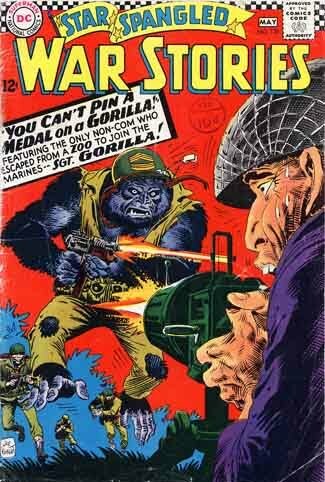 Here's an interesting comic cover for Simian Saturday. Sorry I'm a bit late getting this posted had to work today. My name is Brutorz Bill and I have Gamer A.D.D. (Attention Deficit Disorder). I've tried to deny it, but anyone who has followed this blog for any length of time can surely tell. Back oh so many years ago, when I first got into gaming we rotated DMing in our group. 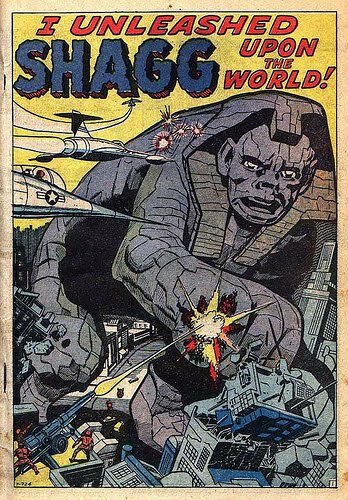 That was back when you could go to the local Sears & Roebuck and pick up the latest RPG. Whoever had picked up the latest gaming product; Top Secret, Star Frontiers, Traveller, Chill, D&D module or whatever would run it for us, we'd play it until we got bored with it or more likely someone else showed up with a shiney new game to try out. We did some long term campaigns, in fact we even did a Gamma World meets Traveller meets D&D, wherein we took our Gamma World characters into Imperial Space raised Heck in the Traveller universe and eventually crashed our stolen starship on a fantasy world where we trounced the Slavelords and set up our own kingdoms (hey it was Junior High, and we had a blast!) all with the same characters, well mostly the same, a couple died (I got to Play and DM in that saga over the many sessions). But most of our campaigns were short term affairs. 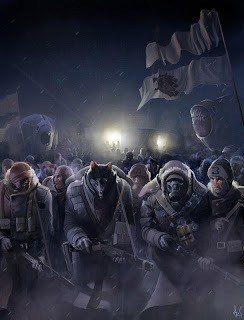 Other than a years long Gamma World Campaign that I ran for my cousin when he came into town on holidays the longest Campaign I ever ran was a 3.0 game that ran for quite a long time and that was a special group of folks. I think part of the reason I played Rifts so long back in the day wasn't a love for the system, but the fact that I could switch gears and try something new without it affecting the story/players. Its not that I dislike long term campaigns, or can't stick to something, its just that I like to play different things. While some folks can play in different games on different nights to get their fix, that just isn't an option with my schedule. I've set down a few times over the years to start up a new Campaign and have shuddered to myself when a few of the players say,"Awesome I can see us playing this Campaign for years and years, can't wait for my character to be 18th level! "...That kinda makes me go "Yikes!" for lots of reasons. One, lets worry about first level for now, 18th is a long ways off (course Prestige Classes sort of encourage some of this forward meta-gaming thinking) and then I didn't know I had signed up for a "Years and Years" DMing this commitment. I know I've cheesed some folks off in the past when I've gotten tired of running something and wanted to run something else,"Whatta ya mean you've got burn-out and want to play something else? ?, We are only 5th level! That's not high enough for you to quit this Campaign!" HUH?? I've found it harder, at least in my area to find others who will run something. Remember, my roots consisted of a whole group of folks who couldn't wait for their turn to DM, now it seems like DM's are few and far between, at least in my area. So what's the point of this post? I guess it is an attempt to look at myself and my gaming style to see if I need to work on my DMing behaviors. I hope to start up a new Campaign when I finish school in a few months and I want to do it right. So what have you guys done to help deal with the dangers of Gamer ADD?? 4th of July, Independence Day here in America. I hope everyone has a safe and happy holiday. I will be spending some quality time with my family today. 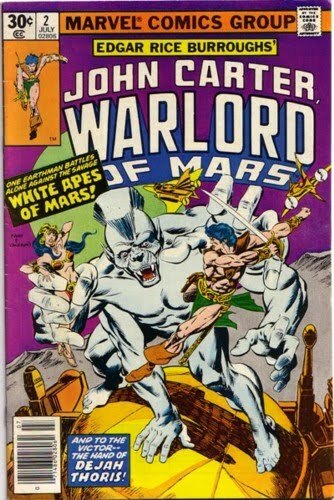 Here's the cover from an old Marvel Comics adaptation of John Carter of Mars.Featuring a big white Martian ape. This one goes out to Clovis Cithog from the Jasoomian Dreams Blog.